The Society’s new season of talks begins on Thursday 10th September 2009 at 7:30 pm in St. Andrew’s Church, Bilston Street, Sedgley. The speaker is David Bills a local historian, raconteur and lifetime Kinver resident. His slide show traces the history of the famous red sandstone dwellings some of which were occupied until the 1950s. A National Trust restoration programme has rejuvenated the Holy Austin houses, but there are other examples in the village of openings cut into the rock. As usual visitors are invited to come along – admission £1. Full membership of the Society costs £4 and gives free access to the programme of talks. 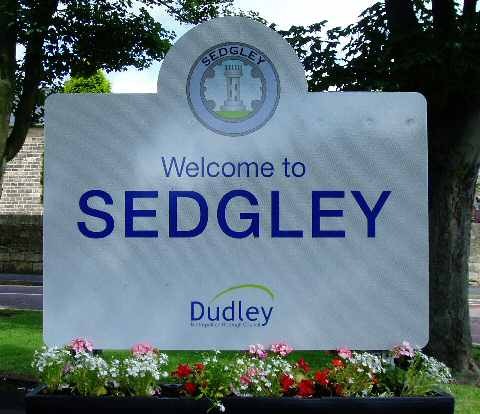 In July 2009 Dudley MBC erected signs displaying a simplified Sedgley Urban District Council civic badge - almost certainly the council's first use on public signage. The original badge was designed around 1895 and in use until SUDC became part of an enlarged Dudley in 1966. However, the new logo has some missing items. Check them out here.